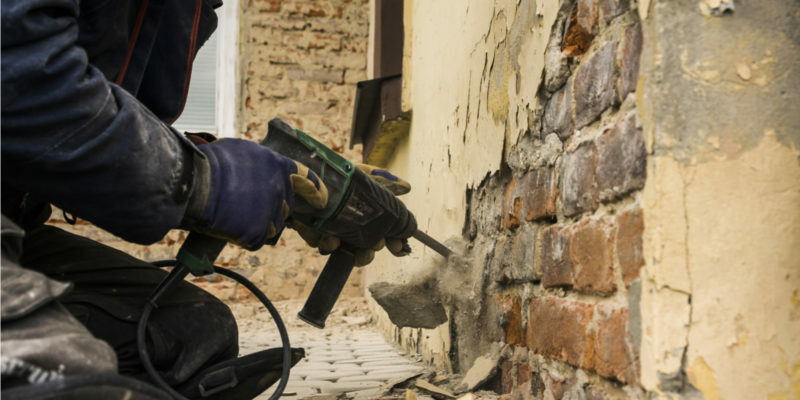 Brick algae stains, brick paint stains, brick efflorescence stains… there are many types of brick stains and all of them can be frustrating to remove. Stubborn stains are often caused by several things. Remember to always start with the gentlest method and work up from there to prevent unnecessarily damaging brickwork. Do not power wash bricks. Sure, it might be tempting, but in the process, you’ll damage the outer glaze on brick surfaces, essentially robbing them of an important barrier against moisture and other exposures. Know what type of brick you’re working with. Softer stone and brick is more absorbent and is therefore sensitive to solvent-borne pigments and moisture. Don’t hose bricks down in the winter or during cold weather as this promotes freeze/thaw cycles that are damaging to brick and mortar. Never use muriatic acid to clean brick stains—it is risky and not a good paint solvent. Don’t try a random solvent on surfaces as this can lead to a big mess and a nasty eyesore. Knowing what type of stain you are faced with will help determine the best cleaning method. Efflorescence is usually white or chalky in appearance. It coats exterior surfaces and is caused when water evaporates through surfaces and into the air, leaving behind salts and minerals that do not turn into vapor. Efflorescence can impact new and old brick surfaces. Use a stiff bristle brush to scrub at the unsightly buildup. Dip the brush in a water or tri-sodium phosphate diluted in warm water. If you cannot remove the stain with a little scrubbing, professional efflorescence removal is recommended. Paint run-down is often mistaken for efflorescence. To tell the difference, look for white-painted surfaces above bricks. To remove paint from bricks, you’ll need a bristle brush and a TSP substitute cleaning solution. Don’t try to bleach it out—this won’t do the trick and could end up causing additional white streaks if the bleach remains on brick surfaces for too long. There’s no one-size-fits-all option for removing paint from bricks. Unique solutions are recommended based on different circumstances. It’s not easy to remove paint from bricks. Spot-cleaning paint can be a small job, but removing large segments of paint from brick is no easy task. It typically requires two chemical treatments, and multiple rounds of brushing and rinsing. Plus, don’t forget proper set up with a drop cloth and protective gear. Hard water stains give bricks a streaked appearance. To clean up the mess, you’ll need a specially formulated acid-based cleaner for bricks. Carefully follow manufacture recommendations and apply to a small surface area first to prevent harming bricks. A more natural option is to clean stains using undiluted white vinegar. Spray and let sit for several minutes and then use a brush to scrub surfaces. Thoroughly rinse to remove all vinegar. Algae stains are common near areas where water drips down, especially in shady locations. Remove algae as soon as possible to make the task easier and to prevent further damage to bricks. You’ll need to fix the cause of moisture or rain-water splash back that is prompting algae to flourish in the first place. Otherwise, it’ll just come right back. Removing algae from bricks involves scrubbing a vinegar-based cleaning solution into bricks using a bristle-brush. Rinse and repeat until the algae is gone. A variety of green, dark, even black stains can resemble algae, but that doesn’t mean it is algae. In some cases, forensic lab testing may be required to identify the substance and find a way to remove it. We remove stubborn brick stains with confidence. Contact us today for a free quote!